The Nebraska Economic Forecasting Advisory Board voted to decrease revenue projections during a Feb. 28 meeting at the Capitol. The board provides an advisory forecast of general fund receipts used by the Legislature to craft the state’s budget. The Nebraska Economic Forecasting Advisory Board voted to raise revenue projections for the current fiscal year during an Oct. 26 meeting at the Capitol. The board provides an advisory forecast of general fund receipts that is used by the Legislature to craft the state’s budget. The Nebraska Economic Forecasting Advisory Board voted to lower revenue projections during an Oct. 27 meeting at the State Capitol. The board provides an advisory forecast of general fund receipts used by the Legislature to craft the state’s budget. 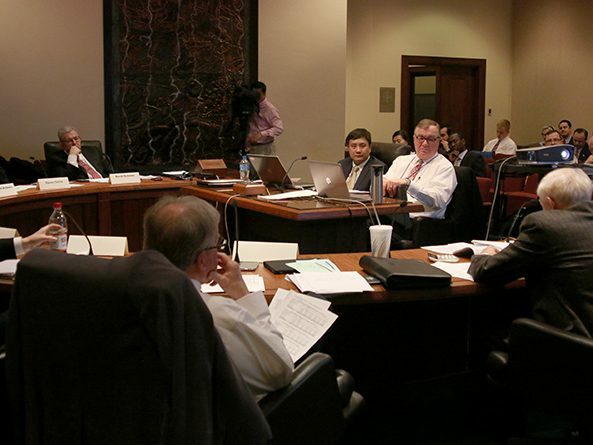 The Nebraska Economic Forecasting Advisory Board voted to lower revenue projections during a Feb. 27 meeting at the Capitol. The board provides an advisory forecast of general fund receipts used by the Legislature to craft the state’s budget.